Way back in August 2013 I met Lori Pedersen, of Lori Pedersen Home Staging + Styling, when she popped into our newly opened Aurora store and fell in love with a Antique Teal Sideboard. Lori had a vision for this beautiful piece and about a month or so ago when I saw the “finished product” posted on her Facebook page (here) I knew I had to rope her into writing a piece for our readers! Now I am going to turn it over to Lori who is going tell you all about her first restyled original from The Millionaire’s Daughter! Hi everyone, I’m Lori! 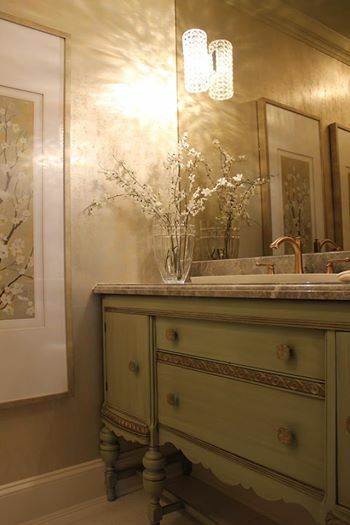 The search for a perfect bathroom vanity found me browsing through the many beautiful pieces available at The Millionaire’s Daughter in nearby Aurora. It didn’t take me long to spot the previously loved vintage sideboard, in a most amazing shade of green. I could see the potential immediately! With a closer look, I decided to consult with an expert to be certain the piece could be restored to its original glory, while still appearing fresh and new. I discussed my ideas with master carpenter Rick Jones, and finishing specialist Susanne at Sunset Innovations. They assured me that with the right care, it could be done. 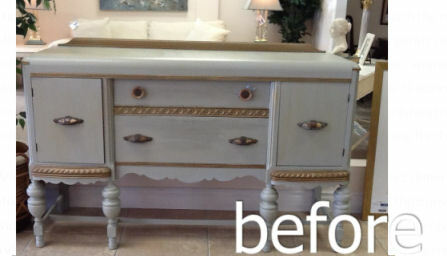 With her expert techniques, Susanne refinished the piece in paint and gold brushing. Once completed, the sideboard looked fabulous again, while still maintaining its character and authenticity. While the cabinet was being restored, I searched for an oblong stone sink of the perfect dimensions. After every measurement was made, and before any cutting would begin, it was re-measured. Prior to the marble being affixed, the cabinet was reinforced to guarantee it could reliably support the weight of the stone. Unparalleled craftsmanship may cost more, but with something one-of-a-kind and original, it is important. I was fortunate to work closely with a master carpenter and very experienced plumber. Anyone else might have discouraged me from pursuing this idea… I had a vision, and with expert guidance they helped bring it to reality. I then came across a lovely widespread faucet in the perfect aged finish, and ensured it was capable of accommodating the combined thickness of the wood cabinet and marble top. The finishing touch was a lucky find – some stunning knobs from Anthropologie. They were the perfect colour, and the right style – meant to be! Pulling it all together involved many components, but it seemed to happen easily: from the metallic wall colour, to the tinted mirror and crystal sconces, and finally the oversized art… I enjoy just standing back and admiring the first Re-Styled Original! Thank you Lori! Check out Lori’s website & Facebook page for more information! Trust me you are going to want this fabulous and talented women’s help for your next home staging project!